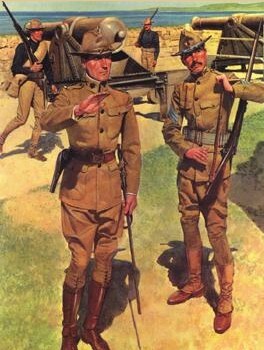 To make up for the shortcomings seen in the Krag rifle adopted in 1896, the Army searched for a replacement around the turn of the century. The Army had seen the Mauser 7mm rifle in action in the Phillipines, and thought that a rifle that combined the features of the Mauser and the Krag would be a superior rifle. The Mauser was patented, however, and the U.S. paid royalties to Paul Mauser for rifles that fell within the claims of his patent. A test model was designed, which used a five cartridge clip-loaded magazine in the stock. Several thousand were made, and tested and modified for two years. In 1903, the rifle was adopted as the Army's main battle rifle and soon adapted to a larger .30 caliber. The .30 caliber bullet was adopted in 1906, and was therefore called the 30-06 (thirty ought six). It had a range of 600 yards, more power than the Krag, a stronger bolt to handle the more powerful cartridge, and a much faster rate of fire. It first saw action in Mexico, Haiti, and the jungles of Nicaragua and was found to be durable and accurate. It was used by American doughboys in WWI, and when compared with captured Mauser bolt action rifles, the design from which the 1903 sprang, it was found to be capable of twice the rate of fire of the Mauser. Fire from American positions was so rapid that Germans thought the American's had machine guns. The 1903 Springfield in the hands of U.S. Marines, earned them a new nickname, "Devil Dogs." The rifle saw action part way through WWII, and was used by the Marines on Wake Island, Guadalcanal, and Corregedor, until it was replaced by the M-1 Garrand, as they became available. It was still used as a sniper rifle in Korea and Vietnam. It has been called the best bolt action rifle ever made. The limey is right. The Brits had extensive marksman training, and the turned down bolt of the British Enfield made for rapid fire. As to the Springfield rifle, the original cartridge for the springfield was a round nosed 200 grain bullet with considerably less velocity than any of the european cartridges. The Springfields were immediately redesigned to use a pointed bullet of 150 grains. it is the second cartridge which is known as the 30.06, and the previous model was the 30.03. It was my understanding that the US ceased making payment under royalty just before or during the first world war. Yes, it was the SMLE that had/has a rapid fire ability greater than any other military bolt action rifle, that I know of. From my reading I have determined that when the rifle was designed the powers that be said don't worry about the patents, just design a rifle and we'll sort the patents out later. Later as I know was after WWI and payments to Mauser were made amounting to $ 200,000 (200K). These payments as best I know were only for the patent involving the charger/stripper clip method of loading. That's about what I know, at least think I know. The 1893 Spanish Mauser was a good and effective rifle. 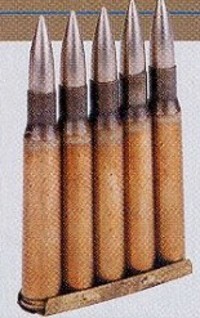 The 7mm cartridge may, in my opinion be one, if not the best infantry cartriged ever to hit the pavement/dirt. The study of these things will never stop and that's a good thing. can anyone help? I have a springfield 1903 # 12375X ((\)) and on barrel it reads RA a bomb and 2-43 can anyone tell me about it ? I believe the RA may refer to the armoury which produced your rifle - the springfields were made in 2 armouries that I know of. The Springfield armoury and the Rock Island armoury. The weapons produced at springfield armoury had case hardened breaches and only 100 were made and given as commemorative awards to retiring cavalry officers. The Rock Island armoury produced many more weapons that were intended for general use. I once owned a Springfield armoury 1903 30.06 and so I did a little research, although some of it may not be correct as sources were difficult to find. The german Mauser 98 family has been called the best bolt action rifle ever made. Springfield is just americanised version of this great rifle. Tom, my military books do not agree with your claim of only 100 springfields and RA should stand for Remington Arms who also made springfields and aperantly did so at rock island arsenal. other private contractors also produced springfields. Mine was built at the springfield arsenal ser #1394326, thats an awful big ser. # for only 100 rifles!